Saison #5, with ginger and pomegranate. Our spontaneously fermented saison blend aged on Pomegranate and freshly ground ginger. The kick from the ginger is balanced by the deep earthiness of Pomegranate and our native microbes to create a well rounded and unique wild ale. Saison #4, with local wildflower honey, Sapphire dry hopped. 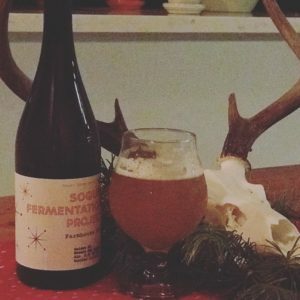 One of our spontaneous beers from last year blended with a 2.5 year old saison. The native microflora imparts a unique stone fruit character to our spontaneous beers, while the fermentation process strips away the sweetness from the honey, revealing the subtle flavors from the hills it was made. Juicy, tart, complex, and delicious. Saison #3, Sterling dry hopped. Exclusively bottled for Healthy Spirits. Saison #3, Sterling dry hopped. 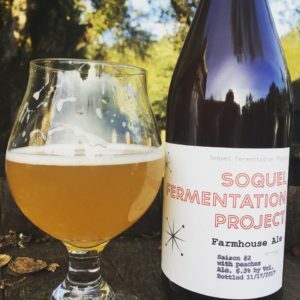 A dry, refreshing, old-world style saison that showcases the spice and mild bitterness of Sterling hops. Restrained acidity with a clean finish. Saison #2, with peaches. Composed of the same base beers as Saison #1, but aged on peaches for two months. A dry, refreshing beer with restrained acidity and subtle peach flavor and aroma. Perfect for those warm and sunny days during winter that remind you spring is around the corner. Saison #1, Mosaic dry hopped. Our interpretation of a traditional old-world style Saison. Restrained acidity, perfectly dry, with sumptuous citrus flavors. Blended from three different brews aged on oak for 6 to 18 months, then briefly aged on Mosaic hops.